Perhaps the most famous aquarist and traveller Heiko Bleher gave an exclusive interview to the organizers of Biotope Aquarium Design Contest. 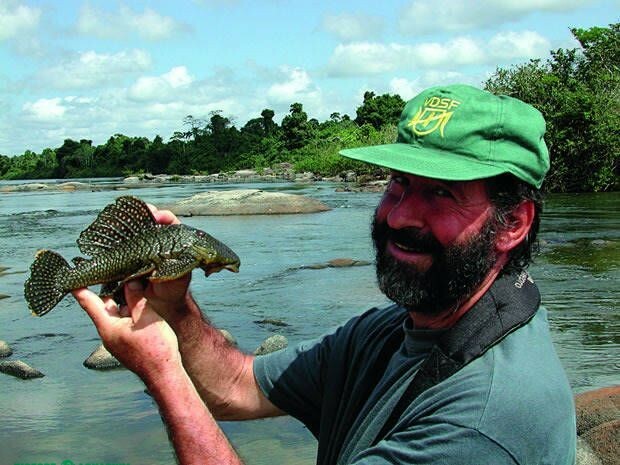 To date, Mr. Bleher discovered more than 6,000 species of freshwater and brackish-water fish. He annually makes expeditions to the wildest and most remote regions of the Earth. He also govesreports all around the world. The year of 2012 was the second time he visited Russia being invited by Unitex group of companies, and he agreed to answer our questions. Interviewer: Oleg Labutov, the author of the idea and the organizer of the Biotope Aquarium Design Contests. Good afternoon, Mr. Bleher! We have a great opportunity to ask you several questions. You are very popular in the world. We would like more people in Russia to know about you, as you are a great source of knowledge for aquarists. What were your impressions of the event, which was held in St. Petersburg at ZooSphere exhibition (final of Biotope Aquarium Design Contest 2012), and of what is happening here in Moscow (Days of High Aquaristic 2012)? Well, you know I have said it already that in my opinion what you have done in St. Petersburg was a very good and very well coordinated biotope contest, and I think by doing this you have helped the aquarium hobby tremendously. Because I have been doing this for a long time in other parts of the world: promoting biotope-correct aquarium. And I want to add that we have now two completely different ways of making aquarium, which have become more and more popular over the last 10-12 years. One of them is the aquascape, and the other is the biotope aquarium. And one has to see the difference, because the biotope aquarium is made for fishes, for the community of fishes that live together. And the aquascape is made for people, not for fishes, because the aquascape is to make people happy, so it is made exceptionally for the beautiful underwater garden. These are two completely different identities. Both are good, but naturally for the aquarium and for the aquarium hobby, and for the love and correct maintenance and keeping of fishes, nature-like or nature-correct, the biotope aquarium must prevail. Then people will see a completely different environment, they will suddenly see behaviour of fishes, completely different. How would you rate the level of aquaristic in Russia, its features? I think the aquarium hobby in Russia over the past few years is actually growing very much. People have more interest, I see that there is more dedication to this hobby, and there is also more diversification. I remember the first time I came to Russia. The hobby was very poor; it existed only with fishes they had been breeding here in Russia. There was no import of fishes. And then they opened the borders and you have a much bigger variety of fishes that can be found in Russia, as well as aquarium plants. And it naturally helps the hobby to grow. And I have seen it's growing constantly in Russia, especially over the past 10 years, may be more than in other parts of the world. And that's very good. You said that you were surprised by a large number of women setting up aquariums in Russia. Are there any other features of the Russian aquaristic that you have noticed? Well, I want to underline it once again, I think it's fantastic, it's very nice, and I actually don't know any other country where so many women would be engaged in this hobby as you have here. And it was a surprise particularly for me in St. Petersburg that out of 10 finalists, selected from the 57 participants, there were 6 women. I think it's very good. In most countries of the world this hobby is unfortunately still done by men. I was also happily surprised, because just a week before St. Petersburg I had done the international biotope aquarium contest in Athens, Greece, very successful. And they had also made the final with 10 contestants, who had to set up a biotope exactly where it was in the world, they have represented small river or creek with fishes that live there. But what you have done is even better than it was in Greece, because you had beautiful layout, the people had to engage themselves to bring a photo of the biotope, which I have done already many years ago, but I had not seen it done by other people. This was very nice, and they made very good biotope descriptions. I think that was very good and it made good impression. It is so important, I think, especially for the hobby. I have noticed it since 2000. I have constructed biotope stand with 9 aquariums of 10,000 litres in total, which I have shown in many parts of Europe, mainly in Belgium, Germany, and now in Italy, and each one had a detailed description of the biotope. People come and read it even in detail. It is not that people just walk into my biotope stand, and just look at the tank and walk out. No, they read information; they want to know about this area of the world. So they get information of some small island or tiny creek, who lives there, they get information of how many species live on a very small area, and what is the surrounding. So this is very good for information. And actually I can see more and more people want to have such an authentic small biotope in their own home. Which one of your expeditions do you remember the most? May be there was something special? Every freshwater habitat on this planet. But if you are asking directly like this, there are two destinations which I do every single year at least once or more. I have been doing Amazon, remotest areas since I can remember. This September I have actually completed almost every single affluent of the Amazon River research. The one is missing which I will do on 1 September next year. But since 1974 I have been also doing New Guinea, Australasia every year. So these are two points where I go simply because I know in these areas there are still remote unexplored places where I can find new species to introduce them into the hobby and naturally for the registration of species for future generations. Where would you recommend Russian aquarists to go? I think it is really important to visit the Amazon in the first place before it's really too late. You should come with me. I will not take more than 2 or 3 people in each of my trips. But I do it every year, 2, 3, maximum 5 Amazon expeditions. I think this is the first place one should visit at least once. And naturally you have your own places in Russia. I was invited to go to Ukraine next week; although it's already cold time of the year, but I will do some research in some small Ukranian rivers. It is just to give you an example that the interest should not be limited by tropical areas. There are also freshwater areas in temperate and cold zones. And sometimes they are very interesting. You can see that in your biotope aquarium contest in St. Petersburg the first prize went to the temperate biotope, they are also beautiful. Once again, how to pronounce your surname: Bley-er or Bley-her? There are a lot of arguments about it in Russia. Well, the correct pronunciation would be Hai-koo Bley-her. It's a very old German surname. It actually goes to the very old times. I was able to trace it back to 1412. This is the most part I could go back. In the recent 100 years or so very few people used this surname as well as name Heiko. Except for Heiko Blessin whom I always call Heiko the Second (laughs). Do you have a hobby that does not belong to the aquaristic? Well, I do not know if you can call it a hobby, but naturally I like photography very much. I made 6-7 million photos around the world. I like doing underwater research in freshwater habitats very much, watching nature, watching the behaviour of animals and naturally fishes. I love swimming. I swim a lot all the time whenever I can in the jungles in every river. You know I write very much. I have more than 1,000 articles, I write books. I do a lot of things, but I cannot say I do particular hobby, when I have a vacation. No. I play tennis and soccer, but it's not a hobby. What would you say to the aquarists of Russia? I want to say to the aquarists of Russia that if ever possible they should do biotope-correct aquariums to have a small piece of nature in their home, which they can be proud of. And whenever they do or want to acquire an aquarium and decorate it, they should always think fish.